Pool exercises are an extremely popular and effective treatment option for fibromyalgia. Whether it's mild exercises, or a more elaborate and physically demanding workout program, the benefits are overwhelmingly positive. Not only does this type of exercise help with strength and flexibility, but it can also have additional health benefits such as reduced pain and improved cardiovascular fitness. There is no doubt in my mind that pool exercises are one of the most effective forms of physical activity that individuals with fibromyalgia can participate in. I speak from experience firsthand. Aquatic exercises are a zero impact form of activity which reduces the pressure on weight bearing joints. This opens the possibility for many people with chronic muscle and joint conditions to introduce an easy and effective way to improve their range of motion and flexibility. Research has shown that pool exercises can also reduce high blood pressure and stress levels which can both lead to serious health conditions if not addressed. Furthermore, cardiovascular fitness increases the level of chemicals in the brain which can help block pain impulses, improve your mood and help reduce disrupted sleeping patterns. There are many different types of aquatic exercises you can do depending on your mobility and skill level. 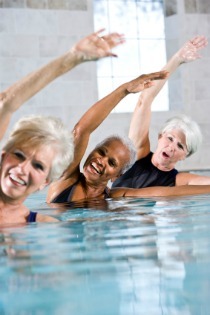 There are water aerobics classes that are usually available at your local gym or health clubs. You can usually check there schedule either online or at the service desk. In addition, if you can get a referral from your doctor or have insurance that allows you to schedule an appointment without one, there are physical therapy facilities that have exercise pools on site. This type of setting allows you to have a more intimate and slow paced exercise program with a trained physical therapist. If you’re not quite as restricted, and are able to do more physically demanding exercises, there's a very informative website swim-teach.com that will help you dial in the perfect form. The better your form, the less energy you will use trying to compensate for a lack of technique. Then you'll be able to have a much more productive workout while stretching and toning crucial areas of your body. As you progress, your muscles, joints and tendons will become much stronger and more flexible, helping you avoid stiff and painful flare-ups. One thing I highly recommend is to use the jacuzzi or hot tub after your workout. If you don't have access to one, then a hot bath immediately when you get home will do just fine. In my experience, if I don't do this after my workouts; I wake up the next day unrested and stiff as a board. Believe me, you will be amazed at the relief you get by doing both of these together. I've had the privilege of meeting many people in their 80's and 90's that contribute their good health to pool exercises and the hot tub. Pool exercises may be intimidating at first depending on the severity of your symptoms and your ability to get in and out of the pool, but if you have someone to go with you or to help you the first few weeks or months, the results may surprise you. In fact, they may be so good that you may eventually be able to do it yourself. regimen can truly be a companion in the fight to regain your strength and flexibility back. I highly recommend you look into this type of treatment if you have fibromyalgia. You will thank yourself a million times over.